“We can verify for now that the Mashki and Nergal Gates have been destroyed,” says Danti, based on the images obtained by the CHI and corroborated by “trusted sources” in Mosul, the ISIS-occupied city that surrounds Nineveh. The statement by Secretary of State Kerry that “in my judgment, Daesh is responsible for genocide against groups in areas under its control, including Yezidis, Christians, and Shia Muslims” was surprising. Although it is a start toward addressing the security issues in the region, it fell short just as the H. Con. Res. 75, designating the Islamic State’s violence against Christians and other ethnic and religious minorities as genocide fell short on 14 MAR 16. During our discussion with Breitbart we stated that the 18 MAR 16 declaration makes the Assyrian Christians and Yazidis a soft target for ISIS, furthermore, given Secretary Kerry’s hands were tied by the language in the H Cong. Res. 75, The Islamic State will now target the Assyrian and Yazidis in Assyria Nineveh Plain more actively as a way of replying to Secretary Kerry’s statement and to the Congressional failure to recognize the Assyrians as an ethnicity. It is a testament to Secretary Kerry’s leadership ability that he was able to word his statement as he did, given all the restrictions and the pressure placed on him by House Representatives and others. Again, in NEC-SE judgement Kerry’s statement was a start but did not solve the security issues of the Assyrian and Yazidi genocide in Iraq and Syria. Both the DoS and Congress have failed to recognize the genocide against the Assyrian ethnicity by lumping the Assyrians into a Christian denominational category only. Although the Assyrians are Christians their ethnicity is being eradicated: they are Assyrian Christians. The targets of ISIS’ Assyrian history-erasing rampage since 2014 have included the 3,000-year-old winged bull statues of the Assyrian city of Nimrud, built in the 13th century B.C. 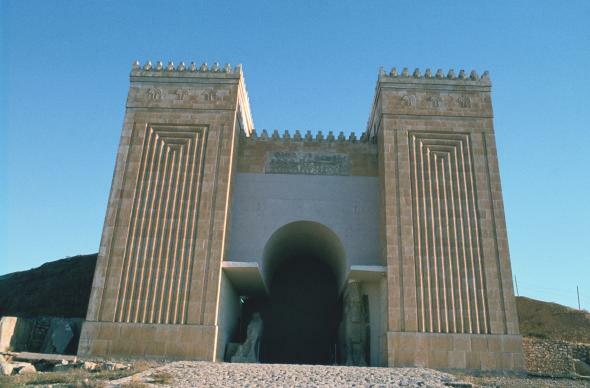 by Assyrian King Shalmaneser I and made the capital of Assyrian kingdom by Ashurnasirpal II in the 11th century BC. Further ISIS Assyrian history-erasing depredations include the destruction of the 2,000-year-old historical site at Hatra; the destruction of the walls of Assyrian Capital City of Nineveh; the bulldozing of the site of the Assyrian city of Khorshabad; and the destruction of the Museum of Mosul, which contained priceless Assyrian artifacts. A week before the destruction of the museum, ISIS attacked 35 Assyrian villages in the Khabur River valley in Syria, driving 3,000 Assyrians away, never to return. Six months before that ISIS drove 200,000 Assyrians out of their homes in the Assyria Nineveh Plain in the heart of Assyrian homeland. Those people still have not returned to their home and most likely will never return in light of the fact that the United Nations Development Programme (UNDP) has made arrangement to rebuild the Assyrian villages in Assyria Nineveh Plain as refugee containment areas for the expected flood of Sunni Muslims that will be displaced when the fight for that city of Mosul begins. UNDP briefed their Pre-Crisis Market Analysis Plan to the Assyrian Women Organization which supports the unitedassyrianappeal.org in Iraq one year to the date when the Assyrians were displaced from the Khabour River valley in Syria. Additionally, YPG Muslim Kurds announced their intention to declare the Assyrian villages of the Khabour River Valley as part of their federalized state in Syria as part of the peace talks, the creation of which is under negotiation in the current peace talks. As for the looting of Assyrian artifacts: this is not unique to the current conflict. As early as 2003 Al-Qaeda forces in Iraq were looting and selling Assyrian antiquities on the black market to finance their operations. More looting of the Assyrian artifacts, this time from the Baghdad Museum, took place immediately following the fall of the Saddam Regime. The Mar Behram Monastery in Iraq, which was built on the foundations of a structure constructed by the Assyrian King Sennacherib II in the 4th Century BC in honor of his children Behnam and Sarah, has also been destroyed. These are Assyrian artifacts and not Christian artifacts that were being destroyed by ISIS. Even the Mar Behram Monastery was Assyrian before the King covered to the Christian faith. In the article we stated: On 14 APR 16 Muslim Sunni Kurdish security forces (Asayesh), the Kurdish Regional Government (KRG) equivalent of the FBI, imposed a blockade on four Assyrian Christian villages in the Nahla district in northern Iraq. This was done in order to prevent Assyrian Christians from traveling to Arbel to participate in an approved civil protest against Muslim Sunni Kurdish attempts to take over their land in the Zoly village. Cars belonging to the KRG security apparatus, driven by those who answer to Masoud Barzani, were parked across the roads leading out of Nahla, preventing more than 100 Assyrian Christians from leaving their villages of Upper and Lower Hezani, Zoly, and Khalilane to participate in the peaceful protest. The problem for the Assyrians is that Congress gave permission and backing for these statements given they only recognized the Assyrians as a religious minority and not as an ethnicity when the full house unanimously supported the removal of the Assyrian ethnicity from the genocide resolution as an ethnicity. What is encouraging for the Assyrians is that at a minimum the genocide against their religion has been recognized. Now it’s time for Congress to support the State Department and recognize the genocide against the Assyrian ethnicity as they have recognized the genocide against the Yazidi ethnicity so that the Department of State can have the flexibility to support the Assyrian Army forces in Iraq who have been fighting ISIS since 11 AUG 2014. So we ask our readers to call your Congressman and Senators and ask them, Will Congress change its stance on the Assyrian genocide After the Destruction of Nineveh Gates? Or will they stand by in silence as the United States is blamed for the death of the Assyrian Christians given Congress refuses to recognize the Assyrians as an ethnicity in the genocide resolutions and refuses to legalize the direct arming and support for the Assyrian Army to fight ISIS as they provide the similar support to the Peshmerga and the Iraqi Army.